Situated just eleven degrees above the Equator, and approximately 80 nautical miles north of Caracas, Los Roques is an archipelago encompassing forty-two coral reef islands and hundreds of sandy cays or islets. The reef may be called Los Roques, or "The Rocks", but in fact, there really are very few rocks here beyond the cliffs of El Gran Roque. Powdery sand and sun rule these islands. Lacking mountains to catch clouds and rain, Los Roques is also very dry. Although cooling trade winds blow consistently most of the year, the hot climate keeps vegetation on the light side, with lots of cacti, mangroves, and leafy ground-covering plants. On this protected paradise you will see iguanas, and turtles nesting on protected cays. The only mammal here, beside the domesticated kind, is the fishing bat. Almost all the population lives on the island of El Gran Roque, and it's also here where the guest accommodations and airstrip are located. Just three sandy streets intertwine between colorful family homes, tiny stores, and the posadas (inns). The central Plaza Bolivar is ground zero for all community celebrations and the place for lively social gatherings. Here, tourists and locals mingle to dance barefooted a potpourri of salsa, rock-n-roll, tango and popular tunes played from a turn-table that is rolled onto the plaza most weekends and on holidays. The sensual dance of the drums is also a common occurrence in the plaza, and in the fisherman's homes that line the streets. The local population of 1,500 people and 240 dwellings absorb approximately 58,000 visitors a year, many of them day-visitors who come here from Caracas and the mainland. Los Roques offers visitors a very unique and different experience from that of most places in the Caribbean. Here the focus should be in the sun, turquoise water, and sandy beaches. If a resort atmosphere is what you're looking for, then Los Roques may not be what you want. But if you dream of an a escape where you can walk barefoot everywhere, birdwatch, snorkle, bonefish, scuba, sunbathe, or simply relax while sipping a cocktail watching the pelicans dive in the distance, then El Parque Nacional Archipelago Los Roques is the place you need. 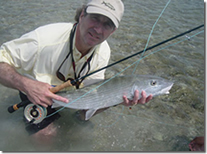 We look forward to assisting you with your fishing plans or another activities.